Thinking about adopting a new dog? Considering how the dog will fit in with your family, lifestyle, finances, and environment are important. You should also consider, what is the best cars for dogs? But not all dogs, your dog! If you are thinking about getting a dog in the toy to medium sized range then, you won’t have issues with interior space. You could probably even get one of those smart cars that you can park on the sidewalk and your new pup would fit just fine; especially if you decide on a small dog like a Chihuahua or a Toy Poodle! If a midsized car is more ideal and you want a medium to super-sized dog then you should consider your traveling habits. There are a number of vehicles for dogs that are perfect for accommodating large dogs. We have reviewed a handful of cars small to midsize, trucks, and SUVs. We determined their dog-friendliness based on their interior cargo space. We based interior space solely on cargo size. Most likely your dog will not be sitting in the driver’s seat (at least we hope not). This is accounted for when determining your car’s total interior space. The cargo space provides your dog with a comfortable, and safe, area to rest or gain some balance on his or her feet. We also decided to take a look at vehicle sizes compared to their fuel efficiency and cost. We know a majority of people don’t want to empty their bank account just so their dog can have a comfortable place to sit in the car. While a truck with a flat bed may seem like it has tons of room for your dog to groove, this isn’t a very safe, or efficient way for your pooch to travel! *Best cars for dogs that we recommend are based on interior cargo space, price, reliability, and fuel efficiency. Minivan – Toyota Sienna: 39.1 cubic feet of cargo space and approximately $25,000 with an overall fuel efficiency of 21 mpg. Runner up – Honda Odyssey: 38.4 cubic feet of cargo space, approximately $28,000 with an overall fuel efficiency of 20 mpg. Minivans are great for the terrier family like the Boston Terrier, Cairn Terrier, and Border Terrier. Note that for 2011 the Odyssey received slightly higher reliability ratings than the Sienna. Compact SUV – Ford Escape Hybrid: 38 cubic feet of cargo space, approximately $28,000 with an overall mpg of 26. Runner up – Chevrolet Equinox or GMC Terrain: Both of these SUVs are comparable. The Equinox has 31.4 cubic feet of cargo space, approximately $23,000 with an overall mpg of 26. The Terrain has 31.6 cubic feet of cargo space, approximately $24,500 also with a overall mpg of 26. Compact SUVs are great for Cocker Spaniels, Corgis, and Cockapoos. Compact SUVs give these dog breeds a comfortable amount of room without being overly big. With Ford making a big comeback in the automotive industry, the Ford Escape received the best reliability ratings of all three cars in the Compact SUV category. Mid-size or Large SUV – Toyota Highlander or Toyota Highlander Hybrid Limited: Approximately $28,000 to $36,000 with an overall 22-27 mpg; with all seats in use cargo room is only 10.3 cubic feet but with no rear seats in use there is 37.5 cubic feet available. Runner up – Chevrolet Traverse: Around $29,000, 24.4 cubic feet cargo space, and overall 19 mpg or the Lexus RX450h (Hybrid) which is much better on fuel efficiency at 26 mpg but pricier at $39,000 to 46,000 but has 33.5 cubic feet of cargo space. 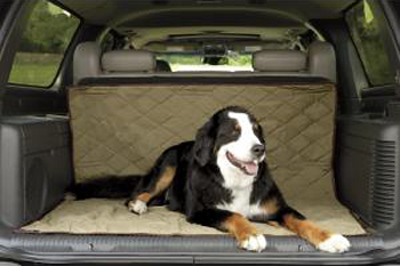 Midsize/large SUVs are great for Bernese Mountain Dogs, Boxers, Giant Schnauzers, and Rottweilers. This category works best for breeds that tend to be larger dogs that need more room in your vehicle. The Toyota Highlander scored the best for reliability in this category. Midsize Sedan – Hyundai Sonata and Ford Fusion: comparable with overall mpg 28/26, price $19,000-$21,000 and 16.4/16.5 cubic feet of cargo space available. Runner up – Kia Optima: $19,000, 15.4 cubic feet of cargo, and overall 28 mpg. Midsize sedans are great for Westies, Yorkies, and Shih Tzus. Midsize sedans don’t provide the largest amount of interior space and these dog breeds don’t grow very large. The Ford Fusion received the best reviews for reliability in this category. Large Sedan – Ford Taurus: $25,000, 20.1 cubic feet of cargo, overall mpg of 22. Runner up –Hyundai Azera: $25,000, 16.6 cubic feet of cargo, overall 23 mpg. Large sedans are good for Puggles, Pugs, Bulldogs, and Jack Russell Terriers. These dogs tend to stay on the small to medium size, but can sometimes grow a bit larger. The large sedans give more wiggle room. The Ford Taurus scored a 9/10 for reliability making it a great overall choice for just about any dog breed. Wagons/Hatchbacks – Volkswagon Jetta Sportwagen TD: mpg of 36, $15,000-$25,000, and 32.8 cubic feet of space, which is better than some of the SUVs out there! Runner up – Subaru Outback: Approximately $27,000, overall mpg of 24 and 36.5 cubic feet of cargo space, which is even more than the Jetta, but higher priced with low fuel efficiency. Wagons and hatchbacks are great for Border Collies, Australian Shepherds, and Retrievers. They provide almost the same amount of room (or more) as SUVs for medium to large sized dogs while reducing costs of gas. Surprisingly the Subaru Outback which usually scores well received a 6/10 for reliability. The Jetta also scored a 6/10 but with their safety coming in at 10/10 the Jetta received the win in this category. As we mentioned, any car will fit a small breeds like the Chihuahua, Pomeranian, Beagle, Basset Hound, and Bulldog, just fine. If you have or are thinking about getting a large dog, like a Great Dane, Newfoundland, Mastiff, Saint Bernard, Weimaraner, or Great Pyrenees then you may want to consider one of the fuel efficient large SUVs we suggested. If an SUV isn’t your thing then take a look at the hatchbacks or wagons. Hatchbacks and wagons provide a surprisingly large amount of cargo space. Even if you have a Golden Retriever, Lab, or German Shepherd, you may want to consider one of the larger sedans or compact SUV. You need to consider room for your family, your belongings, and your dog. Researching the best cars for dogs can be tricky and time consuming. Be sure to take your time and consider all options when shopping. Lastly, remember the best cars for dogs depends upon the breed and your personal needs. If a friend recommends their best cars for dogs list, consider what breed they own and compare to your dog.